Chocolate Chip Cake Brownies – one bowl! Why do I love these one bowl Chocolate Chip Cake Brownies? If you follow my blog regularly, you know I like easy recipes. This one bowl brownie recipe is easy enough that I don’t need to use a cake mix as a starter. My kids love chocolate treats and these are easy to make! Did I tell you there is only one bowl to clean? 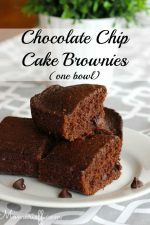 Extra chocolate, moist, chocolate chips and a bit of a cake texture – these chocolate chip cake brownies are the perfect dessert or snack! These are, like the title of the post suggests, cakey brownies. I sprinkle the chocolate chips on top, just before baking. They do sink into the brownie, but, they don’t sink to the bottom. This is a scratch recipe, but it’s easy! With only one bowl to wash. Sometimes it’s the cleaning up that makes me not want to bake. It’s truly one bowl and that’s not hard to wash or even just rinse and put in the dishwasher. This is one of those recipes that is almost as easy as making a mix. So, why not just give these scratch brownies a try? Have your kids gone back to school yet? Mine go tomorrow. And, I am ready. More for the routine than anything. The kids are teens now and very independent. I did have a few more late nights this summer than I wanted. But, if that’s the worst thing with two teens, I’ll take it!! I digress! If your family likes afternoon treats, this one is perfect. It certainly fills that chocolate craving that often comes in the afternoon. Here is the brownie printable recipe for you!! Chocolate Chip Cake Brownies (one bowl). Add eggs and vanilla. Stir again until just combined. Stir dry ingredients into your chocolatey mixture. Add milk, a third at a time and stir together each time. Pour batter into 11 x 13 sprayed or greased pan. Sprinkle chocolate chips on top. They will sink a little when baked. Bake for 25-30 minutes, testing for doneness (when a toothpick poked into center comes out clean). Please sign up to follow my blog! I’ve made it easy for you, just fill out the super short form below! « Easy & Delicious Pumpkin Muffins – TWO ingredients! These look great and I love it that they are from scratch. Thanks for the recipe. Pinning.